From music, to sculpture, to grand scale murals, one local artist is working tirelessly to share his work with the community. 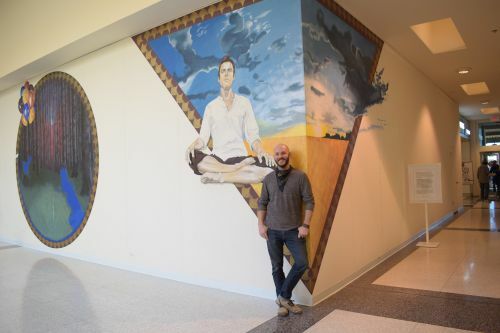 The West Acres Mall is currently hosting its fifth artist-in -residence, Brandon LaPlante, and facilitates his reconnection with his passion for creation, connection to his ethics and the beginning of his next adventure. LaPlante, 34, describes himself as a thrill seeker. It’s not a surprise then, to learn that the day he graduated college he left to go on tour with his band instead of walking in the ceremony. “I’m an adventure seeker through my passion. Anything that I’m passionate about is my thrill,” he said. LaPlante has traveled the world through opportunities with his art. Whether it’s touring in a band or painting murals in Asia, he values adventure, growth and new experiences. Watercolor, acrylic and oil pastel work hang on the walls. Sculptural furniture pieces are arranged throughout the space and merchandise from LaPlante’s former band, “Sleeping in Gethsemane,” along with guitars and amps accompany him in his welcoming, brightly studio space at the JC Penny wing of the mall. LaPlante divides his time between Fargo, North Dakota and Hawaii. While he lives in Fargo, he makes his living on Bill Erbes’ 30-acre vegetable farm. The small scale farm hosts its farmer’s market at the West Acres parking lot, where, in September, LaPlante learned about the residency from a former artist in residence for the mall. It wasn’t long before he was approached by Carol Schlossman, owner of Carol Schlossman Consulting. The consulting firm has worked with West Acres since 2006 as part of the mall’s Regional Showcase Program. The program was created to showcase regional artists, organizations and individuals who make a difference in the community. Schlossman, along with Alissa Adams, the Senior Vice President of Market and Business Development at West Acres, gave him the opportunity for the residency and creating a mural inside the mall. According to Adams, local artist Emily Williams-Wheeler proposed the idea of an artist residency in 2017. Adams goes on to say that LaPlante is the mall’s fifth artist in residence. The artist in residency program hosts studios in vacant spaces until the space is leased by a retailer. The studios are open during mall hours, especially peak mall hours, to give the public access to the artists and their work. For LaPlante, the residency, which started in September and runs through Nov. 11, couldn’t have come at a more perfect time. Since graduating college, LaPlante felt constrained. Going through school and going through training to be a professional artist constricted his freedom to create visual art. According to LaPlante, the residency gives him a chance to have another college-like experience. A chance he’s wanted since reflecting on his first round of university studies. LaPlante went to college at 18, but, now in his 30s, he wishes he waited. LaPlante is working on all of his skills in art, but is developing his personal style in his two-dimensional work. His end goal is to create a body of work that accurately represents who he is now. This residency is the first in his journey to build that body of work. Once this residency ends, LaPlante wants to continue to find, or create, residencies during his future travels. His personal goals aren’t the only project he’s working on. LaPlante, in addition to his residency, is also painting a mural where Orange Julius once stood. This mural is not his first, as LaPlante also painted the mural of the koi fish in The Aquarium, one of Fargo’s concert venues on top of Dempsey’s Public House. LaPlante was excited to work on another mural. Proposed by West Acres as a separate project, LaPlante was asked to create a concept and provide a budget for the 12x75 ft space. Viewers can watch his progress as three large circles are spread out across the wall, in various stages of completion. The concept of the mural evolved quickly in a short amount of time. LaPlante’s first idea was to demonstrate how the world generally tends to be divisive. He wanted to show, through contrast and juxtaposition of subject matter, positive and negative space and technique, how humanity is connected. Now, LaPlante is working to show his desire for humanity to change their perspective from believing in ownership and to focus instead on the idea of stewardship. Stewardship, according to LaPlante, is part of recognizing the impermanence of life. As part of his own ethics, he wants to demonstrate that nothing in life is permanent and nobody can own a single thing on this planet. LaPlante continues to utilize contrast to execute his concept. His current, art nouveau inspired borders around his pieces contrast against his representational realism in his figure work and his abstract, expressive mark-making for the nature scenes. The contrast of male to female, youth and age, nurturing and searching, meditative embodiment and reconciling one’s relationship with the world demonstrates the conversation of recognizing the often at-odds relationship humans have with nature and animals. Along with stewardship, LaPlante wants the viewers to think about who is usually centered in the narratives we tell as a society. Instead of defaulting to human beings, LaPlante wants viewers to question what else could be the main focus of a story, whether it’s animals or nature in its entirety. The residency ends on Nov. 11, leaving LaPlante with limited time to finish his projects. Not only that but once his residency ends, the mural will only be up for a limited time; the work will be torn down to make way for a new store to be built. But the mural being torn down doesn’t bother LaPlante. Instead, the temporality of his piece matches perfectly with his personal code of ethics that includes stewardship and recognizing the impermanence of all things. Once LaPlante’s time at West Acres is over, he plans to use his earnings from the residency to jump start his goal towards more residencies. He plans to utilize his upcoming time in Hawaii to decompress and get re-inspired to create new work and getting residencies set up. One of his goals after the residency is to purchase a bus once he returns in May that he can repurpose, gut, and make a live-in home for himself. The space will provide a home, a studio for his music, art and adventure gear. When that is complete, LaPlante wants to travel next fall throughout the mainland United States in search of more residencies. For now, LaPlante works steadfastly to paint his mural and develop his work. During his stay, he has attracted the attention of a few mall patrons walking by his studio or his mural. And that, according to Adams, is part of the larger goal of the artist in residency program, and West Acres’ general commitment to the arts. LaPlante’s schedule is drastically different since the residency began. By time the mural is finished, he says, it will have taken close to 700 hours from concept creation to completion. Between his contractual obligation to be in his studio for 20 hours a week, and his work on the mural, LaPlante has sacrificed sleep and personal time. But his exhaustion doesn’t mean he isn’t appreciative. There are only a few weeks left of LaPlante’s residency. With each day, the completion of his mural comes closer. There is still time to visit the artist and view his studio, and his mural, before its time under the mall’s stewardship comes to an end.